Chitosan is a naturally occurring polysaccharide derivative of deacetylated chitin. Chitin can be obtained from a variety of sources including the exoskeletal structure of crustaceans (crabs, shrimps, diatoms, etc). Chitosan is derived from chitin using various processes of sodium hydroxide washing to obtain the desired degree of deacetylation and molecular weight. Hemostasis has developed a variety of chitosan-based technologies, including carboxymethylated chitosan in addition to a proprietary modified chitosan. Depending upon the surgical application, different chitosan technologies may be utilized to suit the individual requirements or preferences of the surgeon. Hemostasis currently offers chitosan patches in various sizes that have been FDA-cleared and CE marked as a topical hemostat for moderate to severe bleeding. 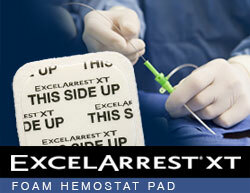 These are ideal for the cath lab and interventional radiology markets as well as ER and trauma markets. Evaluation of a new hemostatic agent in a porcine grade V liver injury model, Bochicchio GV, Kilbourne MJ, Keledjian K, Hess J, Scalea T,. Division of Clinical and Outcomes Research, Department of Surgery, R. Adams Cowley Shock Trauma Center, Baltimore, Maryland 21201, USA; Am Surg. 2010 Mar;76(3):317-20.